You’ve Known Blogger as a Free Blogging Tool, and Here’s How to Get More Out of Blogger! Learn how to create a fully customized website with Free Google Blogger, on your own domain. Exclusive SEO tips for Blogger/Blogspot. Monitize your website with Google Adsense and many more options. It costs only as low as $2.00 to $15.00* per year, to create your website on your own domain and host it forever for free! 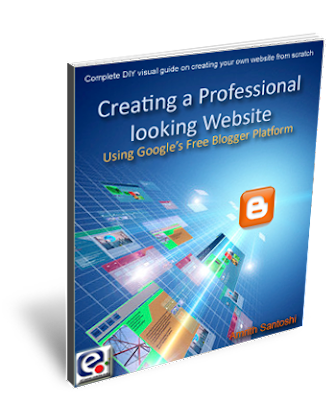 Create a website with blogger which will give the same look and feel of a professionally designed website. This is the ideal solution for creating a professional looking website for your small business. Small business website designs might not be chap as you might expect. But with this complete DIY guide, creating affordable website for small and medium sized businesses become much more easier. You need no prior knowledge or technical skills in web design to create a professional looking website with Google’s free Blogger platform. All you need to know is English language. Everything is illustrated and explained in simple language.